The New York–New Jersey Harbor Estuary, also known as the Hudson-Raritan Estuary, is in the Mid-Atlantic states of New Jersey and New York on the East Coast of the United States. The system of waterways of the Port of New York and New Jersey forms one of the most intricate natural harbors in the world. The harbor opens onto the New York Bight in the Atlantic Ocean to the southeast and Long Island Sound to the northeast. Although the overall form of the estuary remains unchanged from the time of Giovanni da Verrazzano's visit in 1524, no part of it remains unaffected by human activity, and some parts, such as Hell Gate and Ellis Island, have been almost completely altered. In the greatest hidden change, the navigational channels have been deepened from the natural 17 feet (5.2 m) depth to 45 feet (14 m), in some places requiring blasting of bedrock. There is an extremely complex system of tides and currents. Both the Bight and the Sound are essentially marine bodies with both tides and saltwater, but the Sound compared to the Atlantic is about 20-30% less saline (as an estuary), and the tide is about 3 hours later with as much as 70% more variation. Rivers add a fresher, non-tidal inflow although the tide and brackishness extend well up rivers  throughout the extended hydrologic system from Albany to Montauk Point to the Hudson Canyon region of the New York Bight. The New York Harbor Observing and Prediction System (NYHOPS) utilizes information from sensors, weather forecasts, and environment models to provide real-time forecasts of meteorological and oceanographic conditions in the area. Since the Ash Wednesday Storm of 1962 beaches along the shores of the East Coast have been regularly replenished with sand pumped in from off-shore. The United States Army Corps of Engineers (USACE) coordinates the projects. In 2016 the USACE and the Port Authority of New York and New Jersey produced a comprehensive restoration plan for the harbour region, which included proposals to mitigate the effects of sea-level rise through projects to restore natural areas. The lists below includes features of the Port of New York and New Jersey with a waterborne emphasis, starting with natural features. Where possible the list proceeds from the Lower Bay entrance approximately clockwise around the Harbor. The alternative sorting is by jurisdiction. Official references are the NOAA Coastal pilot, NOAA nautical charts, and USGS topographic maps. Many jurisdictional issues appear in U.S. law. Ellis Island—All of the landfill portion of Ellis Island beyond its 1834 waterfront is in Jersey City, New Jersey, as is all water surrounding Liberty and Ellis Islands. The original island is an exclave in New York State. One of the many duties of the Port Authority of New York and New Jersey is to develop trade interests in the New York-New Jersey area. The Port Authority operates most of the containerized port facilities listed here, and also collaborates with the Army Corps of Engineers to maintain shipping channels in the harbor. For lists see and. Active unless noted. ^ Society, National Geographic (14 November 2016). "Hudson-Raritan Estuary". Retrieved 28 March 2017. ^ "Urban Core". Retrieved 28 March 2017. ^ Muka, Samantha (August 11, 2015). "Building Beaches: Beach Nourishment in the United States". Retrieved 10 April 2017. New York State has the longest history of nourishment in the country. The first beach nourishment project was the construction and expansion of the shoreline off of Coney Island and Brighton Beach. ^ Seabrook, John (July 22, 2013). The Beach Builders. The New Yorker. Retrieved 18 April 2017. ^ "NY District Coastal Storm Risk Reduction Projects and Studies Map". USACE. Retrieved 19 April 2017. ^ Anderson, Jenny (May 18, 2013). "Rebuilding the Coastline, but at What Cost?". The New York Times. Retrieved 19 April 2017. ^ Hudson=Raritan Estuary Comprehensive Restoration Plan (PDF) (Report). USACE. June 1, 2016. Retrieved 19 April 2017. ^ "62 FR 46142 - Simultaneous De-designation and Termination of the Mud Dump Site and Designation of the Historic Area Remediation Site". Retrieved 28 March 2017. ^ Chapter 11, New York Harbor and Approaches, Coast Pilot 2, 35th Edition, 2006, Office of Coast Survey, NOAA. ^ NOAA nautical charts 12327 New York Harbor (1:40,000 scale), 12324 Sandy Hook to Little Egg, 12350 Jamaica Bay and Rockaway Inlet, 12402, 12401 New York Lower Bay, 12331 Raritan Bay and southern part of Arthur Kill, 12332 Raritan River, 12333 Kill van Kull and northern part of Arthur Kill, 12334 New York Harbor (Upper Bay and Narrows, 12337, 12335, 12338, 12341 Archived 2007-09-26 at the Wayback Machine, 12339 Archived 2007-09-26 at the Wayback Machine, 12366 Archived 2007-09-26 at the Wayback Machine Long Island Sound and East River, found on page Nautical charts Atlantic Coast charts online Archived 2006-09-02 at the Wayback Machine, Office of Coast Survey, NOAA. South Amboy, Keyport, Sandy Hook West, Sandy Hook East. ^ Title 33. Navigation and Navigable Waters Archived 2006-09-26 at the Wayback Machine USC. See Section 59. 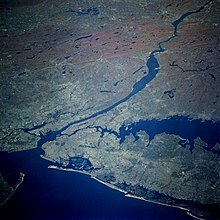 ^ a b c All of the landfill portion of Ellis Island beyond its 1834 waterfront is in Hudson County, NJ. All water surrounding Liberty and Ellis Islands is in Hudson County. ^ "Intent to Prepare a Draft Environmental Impact Statement (DEIS) for the New York and New Jersey Harbor Navigation Study: Feasibility Phase". Federal Register Volume 63. Government Printing Office. March 24, 1998. Retrieved 2014-08-31. ^ Reports of Channel Conditions Archived 2008-10-29 at the Wayback Machine, USACE, Nov. 2004: "Partial Anchorage Channel: Starts approximately 3,990 Ft. seaward of Red Gas #2; Ends approximately 1,660 Ft. landward of Red Light & Bell #21. Authorized project: Width: 2000 ft, Length: 2.34 nmiles, Depth 45 ft.... Shoaling exists and begins approximately 2,230 Ft. seaward of Red Gas #2 and proceeds landward with a length of approximately 600 Ft. and a width of approximately 60 Ft."
^ Hearing Notice for Department of the Army Corps of Engineers, N.Y.S. Department of Environmental Conservation 21/1/2004. ^ Simplified map Bayonne Peninsula Chap. 6, CPIP Toolkit, PANYNJ. ^ Inventory of Historic Light Stations: New Jersey Lighthouses and Inventory of Historic Light Stations: New York Lighthouses NPS lists. ^ New York Lighthouses and New York Lighthouses Lighthouse Friends 2001-2005. This page was last edited on 11 September 2018, at 22:00 (UTC).